It really is no secret that we love file folder games. So much so that we’ve started trying to find ways to fit them into as many theme units as possible. So, it should come as no surprise that we found a way to add another Christmas themed game to our collection. This adorable matching game is perfect for the holiday season and a great way to work on those early math skills, fine motor skills, problem-solving skills, and so much more! Putting this game together couldn’t be easier. First, you’ll need to gather up a few supplies. To start, cut out all of the pieces included in the download. This includes the baking sheet and eight various Christmas cookies. The baking sheet portion of the game has a spot for each cookie to fit into already on it. Once your pieces are cut, simply adhere the baking sheet to the manila folder. This piece is large, so it comes in two pieces. Place the two halves of the baking sheet printable onto the manila folder with the fold of the folder being where the two pieces of the baking sheet meet. A glue stick or small piece of tape may come in handy to hold those pieces in place while you cover them with contact paper. Once the contact paper is down, add small pieces of Velcro to each of the cookie shapes, saving the other side of the Velcro for the cookies themselves. Next, laminate the eight different Christmas cookies for durability, stick the opposite Velcro pieces onto the back of each one and you’re ready to play! 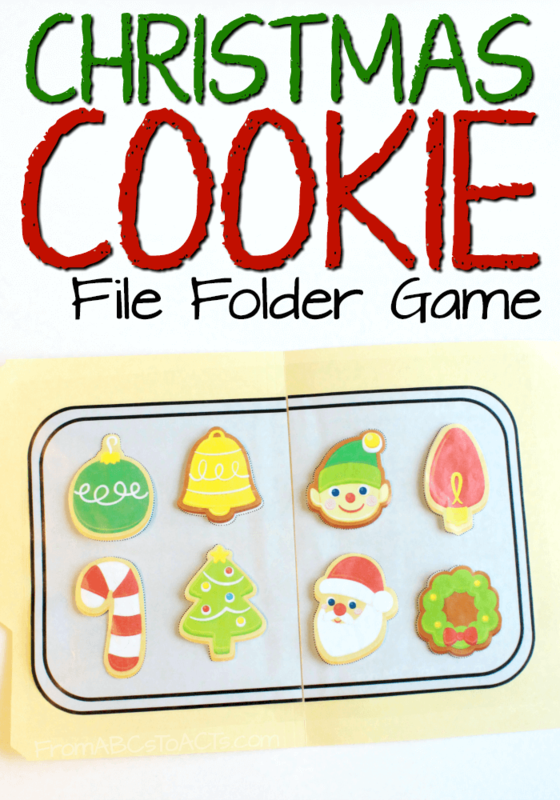 Simply have your child match the Christmas cookies to the corresponding shape on the file folder baking sheet.